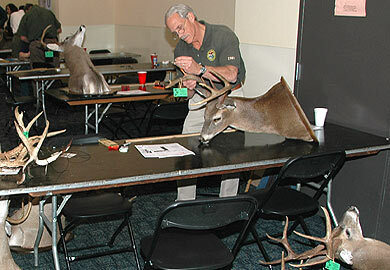 Each year during March, the S.C. Department of Natural Resources (DNR) measures deer antlers throughout the state, with a major effort during the Palmetto Sportsmen's Classic scheduled for March 18-20 at the State Fairgrounds in Columbia. A total of 6,565 sets of white-tailed deer antlers, including 6,314 typical racks and 251 nontypical, are currently ranked on South Carolina's all-time antler records list, according to Charles Ruth, Deer and Wild Turkey Project coordinator for DNR. Minimum scores for state record listing are 125 points for typical antlers and 145 points for nontypical antlers. Measurements are based on the Boone and Crockett system. Although record deer have been recorded from all counties, Aiken, Anderson, and Orangeburg counties have produced the greatest numbers in the past three to four years. Generally, larger deer are more abundant in areas that have fewer deer, as compared to parts of the state with high deer numbers, according to Ruth. Last year's measuring sessions produced 176 new entries into the South Carolina records list. For additional information on the Antler Records Program visit the DNR website at the following address: http://www.dnr.sc.gov/wildlife/deer/index.html. Clemson: At DNR Office, 311 Natural Resources Dr., by appointment only during March (864) 654-1671 ext. 16.